combined system: 70 to 90 g including 60 to 80% of volatile matter. The amount of pollution discharged per inhabitant will rise with their lifestyle and usually with the size of the urban centres; however this increase does not take place as fast as that of the volume discharged so that the wastewater that is collected tends to become more dilute. Poor systems construction encourages penetration by spurious water, aggravating this trend. 10 to 25 L for a 6 mm bar screen. This matter has a 60 to 75% water content after draining and pressing. Approximately 12 L of grit is collected per year and per inhabitant in a combined system servicing a detached house type development, and 5 L for a cooperative housing development. Grease removal varies depending on country and habitat. 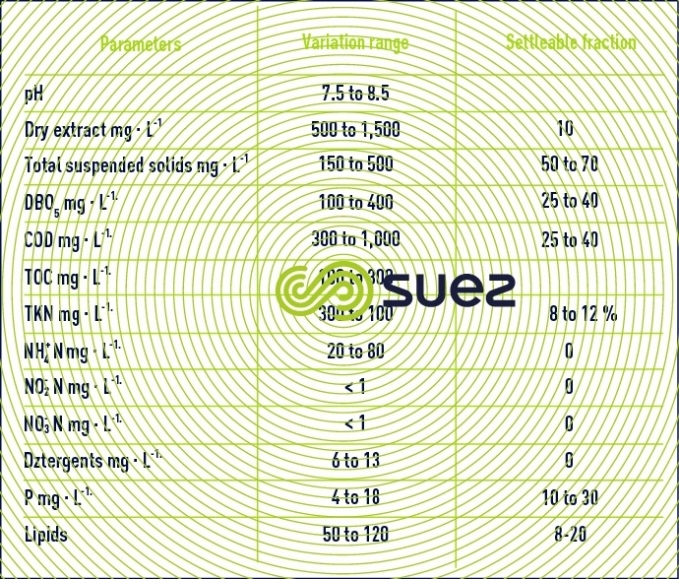 In France lipid levels of 16 to 18 g lipid.p.e. -1.d-1 have been recorded. However, only a fraction of these lipids is fixed (a fraction that is extremely temperature-dependant) and suitable for collection in a grease remover: Typically, only 10 to 20% of total lipids, or 1.5 to 3.5 g.p.e-1 at temperatures of approximately 15°C (see products to be separated out). Thus, the figure of 60 g·d–1 per p.e. has been adopted as the reference by European Directive N° 91/271/CEE of the 21st May 1991. Approximately 1/3rd of this pollution is dissolved, the remaining 2/3rd being bonded to particles (that may or may not settle). Generally speaking, the percentage of settleable organic pollution in a combined system will be higher than in the separate system but will vary significantly from site to site. tends to vary between 2 and 2.8. In general, this ratio will be higher in the developed countries (2.2-2.8) than in the developing countries (2 to 2.3). Table 30 provides UWW average property ranges for France. In household waste water, NK concentration will be equal to approximately 20 to 25% of the BOD5 concentration. The daily input of NK will be between 10 and 15 g.d-1 per inhabitant. The daily input of phosphorus will be equal to between 2.5 and 3 g per inhabitant. This phosphorus mainly comes from human metabolism and the use of detergent products. The implementation of legislation on detergents is leading to a gradual decrease in this input. The widespread use of biodegradable detergents has reduced foam-associated operating problems for plants. However, the consumption of these products continues to rise. The most harmful elements are heavy metals (especially for sludge discharged by treatments). These are mainly industrial elements created when metal processing shops are connected to urban sewers (even when appropriate pre-treatment is carried out). However, heavy metals can be diffuse: pipe corrosion, especially within dwellings... Copper, zinc, cadmium, chromium, lead, mercury and nickel are the most widely encountered pollutants. These elements are usually present in concentrations of less than one mg. L-1. Discharging toxic products into the mains drainage and, even worse, into the environment, is prohibited by law (e.g. cyanides, hydroxylated cyclic compounds). 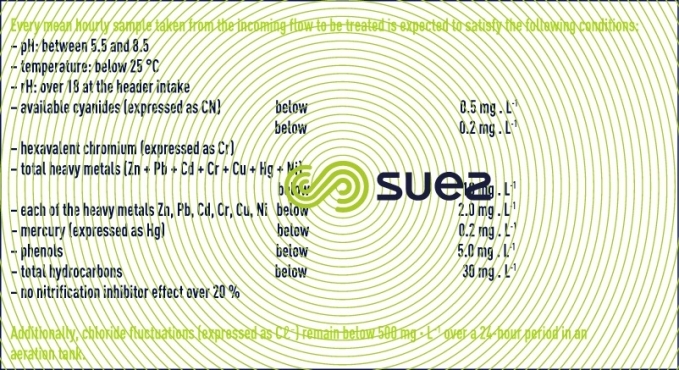 Nevertheless, a proportion of solvents (stain removers), detergent and household products can be found in the sewers and they contribute to non-biodegradable "hard COD" and, therefore to the dispersion in the environment of extremely persistant products such as chlorinated solvents, PCB, PAH, all these products being present as traces (ppb to ppm) and some, as already seen under water’s chemistry, come from drinking water. UWW carry many micro-organisms including pathogens: bacteria, viruses, protozoa, helminths (see aquatic organisms). As the identification of pathogenic organisms in water is a lengthy process, routine checks use test germ counts. The most frequently used test germs are total coliforms and faecal coliforms, mainly Escherichia coli and occasionally faecal streptococci. In 100 mL of UWW, counts will mostly produce 107 to 109 total coliforms and 106 to 108 faecal coliforms. Note: on a given site, the total coliform/faecal coliform ratio will mostly vary between 4 and 7. In UWW, the value to be derived from monitoring germs lies mainly in being able to estimate decontamination levels (or partial disinfection) achieved: the number of logarithmic units (power of 10) eliminated by a given treatment is used to express this value; e.g. 3 log reduction when going from 107 to 104 total coliforms. 100 mL–1. Note: although coliforms may have disappeared from an effluent, this does not necessarily mean that the effluent contains no pathogenic germs.